Pebbles’ costume was made using a green tank top bought from a second hand store. With a little help from my kids, we made and applied the black felt appliqués to the top using a hot glue gun. The blue shorts were purchased and did not need to be altered, however I did tie a few small bones onto them that were purchased at a party store. To finish the costume off I applied orange hair spray and a vinyl dog’s bone in my hair which I purchased at a pet store. Bam-Bam’s costume was completely homemade. The skirt was made using orange raw silk fabric with black felt appliqués applied using a hot glue gun. The bottom of the skirt was cut on angles in order to achieve the desired “prehistoric” look. The skirt was wrapped around the body and fastened with a large safety pin. The sash was made using brown flannel fabric that was roughly cut in order to achieve the desired shape. A vinyl dog bone was tied onto the front end of the sash and the sash was then attached to the skirt using safety pins. An orange hat was purchased at a thrift shop and black felt appliqués were also glue-gunned to this. Bam-Bam’s club was purchased at a local party store. 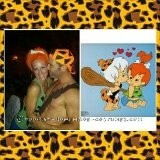 This Pebbles and Bamm-Bamm couple Halloween costume was fairly simple and fun to make. We had a lot of positive feedback on it too.